Tari, F., Manteghian, M., Tazarv, S. (2018). Synthesis of Nickel/ Molybdenum Oxide Bimetallic Nanoparticles via Microwave Irradiation Technique. International Journal of Nanoscience and Nanotechnology, 14(1), 57-64. F. Tari; M. Manteghian; S. Tazarv. "Synthesis of Nickel/ Molybdenum Oxide Bimetallic Nanoparticles via Microwave Irradiation Technique". International Journal of Nanoscience and Nanotechnology, 14, 1, 2018, 57-64. Tari, F., Manteghian, M., Tazarv, S. (2018). 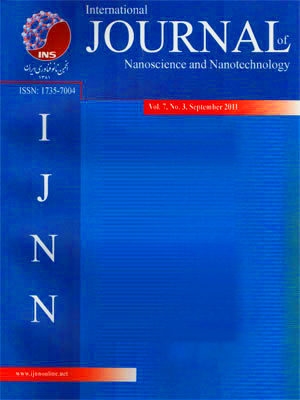 'Synthesis of Nickel/ Molybdenum Oxide Bimetallic Nanoparticles via Microwave Irradiation Technique', International Journal of Nanoscience and Nanotechnology, 14(1), pp. 57-64. Tari, F., Manteghian, M., Tazarv, S. Synthesis of Nickel/ Molybdenum Oxide Bimetallic Nanoparticles via Microwave Irradiation Technique. International Journal of Nanoscience and Nanotechnology, 2018; 14(1): 57-64. 1Synthesis of chemical, polymeric and petrochemical Department, Research Institute of Petroleum Industry, Tehran, Iran. 2Department of Chemical engineering, Tarbiat Modares University, Tehran, Iran. Nickel-molybdenum oxidebimetallic nanoparticles were synthesized in ethylene glycol using the microwave irradiation technique. According to the results, successive reduction of nickel and molybdenum ions, followed by thermal treatment of obtained nanoparticles led to formation of core-shell structured nickel-molybdenum oxide nanoparticles. According to the results, the thickness of the shell and core were 5 and 40 nm, respectively. The structure and composition of nanoparticles were characterized by transmission electron microscopy (TEM), X-ray diffraction (XRD), UV-vis spectroscopy, scanning electron microscopy (SEM) and energy dispersive spectroscopy (EDS).